Butter is a fat made from the cream of cows' milk. It's not pure fat, however. Around 16% to 17% of butter is water, and milk solids make up another 3% to 4%. 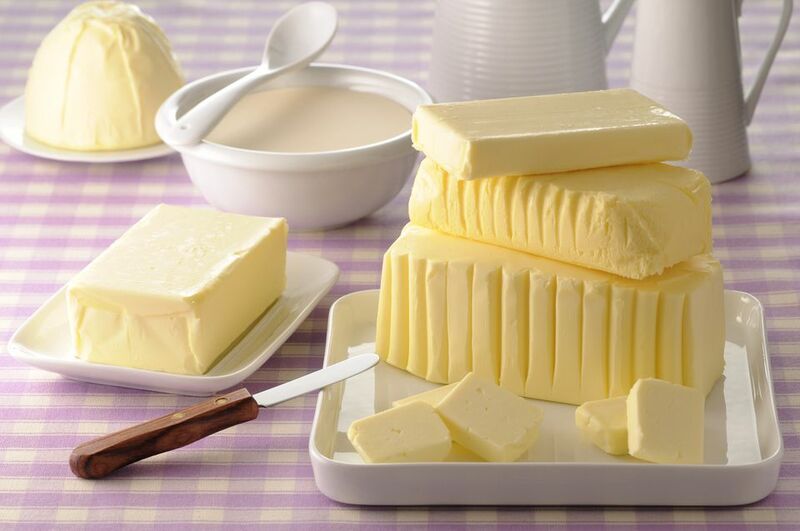 Ordinary butter is only about 80% fat. Due to its rich, creamy mouthfeel and its sublime flavor, which no other product can come close to matching, butter is by far the preferred fat to use for nearly every preparation in the culinary arts. That includes everything from sauce making to baking. Butter has a melting temperature of 98.6 F, which happens to be the temperature inside your mouth. Vegetable shortening has a higher melting point, which means your mouth isn't warm enough to melt it, so it can feel greasy in your mouth. Some butters available in supermarkets have a small amount of salt added as a preservative, but if you go through your butter reasonably quickly, you shouldn't have a problem with your butter going bad. In most cases, you should go ahead and buy unsalted or "sweet" butter. In general, you're always better off controlling how much salt goes into whatever you're preparing. When you're baking, you should always use unsalted butter. The reason for this is that salt toughens the gluten in flour. To make sure the recipe turns out the way it's supposed to, it's best to avoid adding any extra salt than the recipe calls for. When heated, butter develops a magnificent nutty flavor as the milk solids (proteins and sugars) caramelize. When butter is used as a cooking medium, such as for sautéeing vegetables, it complements and enhances the flavors to the food that is being cooked in it. It also adds complexity to the flavor of sauces. While its flavor is highly prized in cooking, there are drawbacks to cooking with butter. For one, it has the lowest low smoke point of any form of fat. The smoke point is the temperature at which a fat starts to smoke when heated. Butter starts to smoke at around 350 F.
Sautéeing is a form of cooking that uses very high temperatures (400 F or hotter), so it's common to use a combination of butter and some other oil, like canola or safflower. Another way to cook with butter at higher temperatures is to use clarified butter. Clarified butter is the pure, golden butterfat from which the milk solids and water have been removed. Since it's the milk solids that burn the fastest, pure butterfat can be heated much higher (around 450 F) before it starts to smoke. Clarified butter is also preferred for making a roux, which is one of the most common ways of thickening a sauce. Clarified butter is better for this because the water in ordinary butter can cause an emulsified sauce like Hollandaise to separate. When preparing pastry and pie crusts, butter can make the dough slightly more difficult to work with because it's harder than shortening. On the other hand, shortening doesn't have any flavor. Shortening can leave a greasy feeling in your mouth. As a compromise, some bakers use a combination of butter and shortening. Remember also that shortening is pure fat, whereas butter is only about 80 percent fat. So if you substitute one for the other, keep in mind that shortening has 20 percent more fat by weight, while butter brings additional water to the mixture, which could affect how the recipe turns out. There's also a product called European butter, which can go as high as 86% fat. In addition to being more flavorful, European butter is also better for making flaky pie dough or puff pastry.